Dental disease is the most common infectious disease of our pets. Over 80% of cats and dogs over the age of 3 require dental treatment now. The Good News is that the majority of dental problems are TREATABLE and nearly all are PREVENTABLE. Helping to prevent it will not only help prevent tooth abscesses, bad breath and loss of teeth - but will also help prevent heart, kidney and other internal diseases in later life. Don't turn your nose to Fido's or Fluffy's bad breath! That odour might signify a serious health risk, with the potential to damage not only your pet's teeth and gums but its internal organs as well. That is why we are happy to give your pet a FREE dental health check. It's our way of highlighting this common disease and promoting good dental care for pets. Remember to ALWAYS reward your pet with lots of praise during and after tooth brushing. Often the attention and the nice taste of the pet toothpaste (usually poultry flavoured) is reward in itself - but it doesn’t do any harm to add to that. A DentaStix, Dentachew, Oral Bar or similar treat that has been proven to assist in oral hygiene can make a great reward. However, the best reward your dog will receive is that their health will be greatly improved and lots of problems can be avoided by regular toothbrushing. Toothbrushing is a vital part of your pet's preventive health care. It is just as important as their regular vaccinations. Brushing your pet’s teeth regularly is the gold standard and best way to help prevent gum disease and keep their teeth and gums healthy. Here are some helpful guidelines on how to brush your dog and cats teeth. By introducing tooth brushing slowly, you can help your dog learn to enjoy it – or at least to tolerate it! Keep sessions short – three minutes is plenty. Every dog is different – so go at your dog’s pace and give lots of praise. Use three pea-sized amounts of dog toothpaste – one each for the left, right and front of the mouth. Take care putting your fingers into your dog’s mouth. Don't try this if your dog is aggressive or prone to biting. Repeat each stage for five days before moving to the next step. Wash your hands and smear a little bit of toothpaste on your index finger. Let your dog lick the toothpaste from your finger. Smear your index finger with toothpaste. Gently rub your finger over your dog’s teeth and gums. Don’t put your finger in further than your dog is comfortable with. Wet the toothbrush with water and then smear it with toothpaste. Let your dog lick some of the toothpaste off the bristles to get used to the feeling. Gently hold their mouth around the muzzle to stop them chewing the brush. Put your hand across your dogs nose and lifting the lips, gently brush the canines (the big, pointy teeth) up and down. Start by angling the brush towards the gum line and brush away from the gum towards the tip of the tooth. As before, brush your dog's canine teeth up and down. 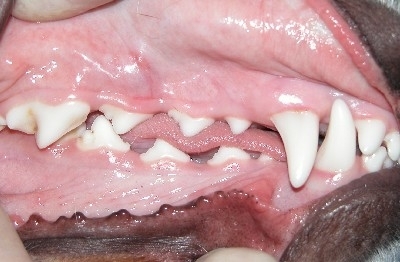 Slowly move along to the teeth behind the canines, using a circular motion. Only go as far as your dog is happy with. Brush both sides of the mouth. As before, brush the canines, then the back teeth and finish with the incisor teeth. Gently brush the front teeth up and down. Gradually build up the amount of time you spend brushing until you reach two to three minutes. For maximum protection, brush your dog’s teeth every day. There is no point pretending that brushing cats teeth are as easy to do as dogs. They are not. So it is even more important to try and get them used to having their mouths examined and their teeth brushed from an early age - ideally start as young kittens. Accustom your cat to having her head held by regularly doing this and rewarding quiet acceptance with praise and a tasty reward. Place your hand flat on top of her head, but pull your little finger back so that it lies on top of her neck. The front part of your hand should be just behind her eyes, with your thumb down towards the corner of the mouth. Her neck will then lie between your 4th and 5th fingers. You can then gently rotate her head back on the neck (using your little finger as a lever or hinge). As the head comes back the mouth will naturally open a little. Using your thumb you can lift the lip and examine the teeth. Your fingers can then lift the lip on the other side and examine that side. Finally you can gently press down on the front teeth of the lower jaw with your other hand and examine the inside of the mouth. The teeth should be free of calculus and the gums should be nice and pink - not red or bleeding. The toothpaste MUST be a special pet toothpaste. Human toothpaste is NOT designed to be swallowed and will often cause problems for our pets - remember how much smaller a cat is than a fully grown person! You can purchase a suitable toothpaste from the surgey. The toothbrush and paste can help clean plaque and early stage calculus from the tooth and most importantly the sub-gingival area. You can accustom your cat to the toothpaste by putting a little on your finger and gently putting it onto her lips or gums. Most cats quite like the taste and will readily accept this. Then place some toothpaste onto the brush. Holding your cat's head, as shown above, gently place the toothbrush and paste onto the side of the teeth. Slowly move the brush in a circular movement. Remember not to try and do too much initially. Over a period of weeks you can gradually increase the length of time you spend and the effectiveness of the cleaning. Do not try to rush things, or you will upset your pet. Toothbrushing will then become a nightmare for all concerned and it will not be achieved. Far better to try and do a little and gradually increase the effectiveness. Brushing the teeth is the ideal. However for some cats it will prove impossible - even with lots of patience. For these cats use of a proper diet designed to help keep the teeth clean is imperative. In addition, using suitable dental treats can help reduce plaque. We can give advice on suitable diets. Even with toothbrushing, a professional dental scale and polish will sometimes be required. 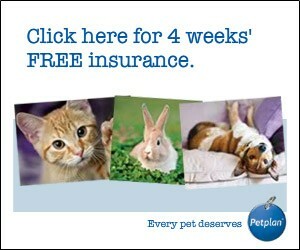 Thanks to petsmile.org You can download a copy of A Gudie to Feline Dentistry by clicking on the link below.